Lactate dehydrogenase (LDH; E.C. 1.1.1.27) is a crucial enzyme involved in energy metabolism in muscle, facilitating the production of ATP via glycolysis during oxygen deprivation by recycling NAD+. The present study investigated purified LDH from the muscle of 20 h anoxic and normoxic T. s. elegans, and LDH from anoxic muscle showed a significantly lower (47%) K m for L-lactate and a higher V max value than the normoxic form. Several lines of evidence indicated that LDH was converted to a low phosphate form under anoxia: (a) stimulation of endogenously present protein phosphatases decreased the K m of L-lactate of control LDH to anoxic levels, whereas (b) stimulation of kinases increased the K m of L-lactate of anoxic LDH to normoxic levels, and (c) dot blot analysis shows significantly less serine (78%) and threonine (58%) phosphorylation in anoxic muscle LDH as compared to normoxic LDH. 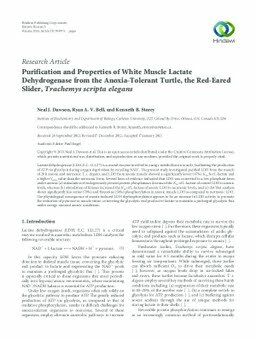 The physiological consequence of anoxia-induced LDH dephosphorylation appears to be an increase in LDH activity to promote the reduction of pyruvate in muscle tissue, converting the glycolytic end product to lactate to maintain a prolonged glycolytic flux under energy-stressed anoxic conditions.